One day, the stars aligned. The produce gods smiled upon me. Ten months later, I still have not been able to recreate the perfect fried green tomato sandwich. I have tasted fried green tomatoes, humble and dressed up. I wonder how chefs will contrast that tart flavor and satisfying crunch next. And I also wait patiently for that window of opportunity to open up again. 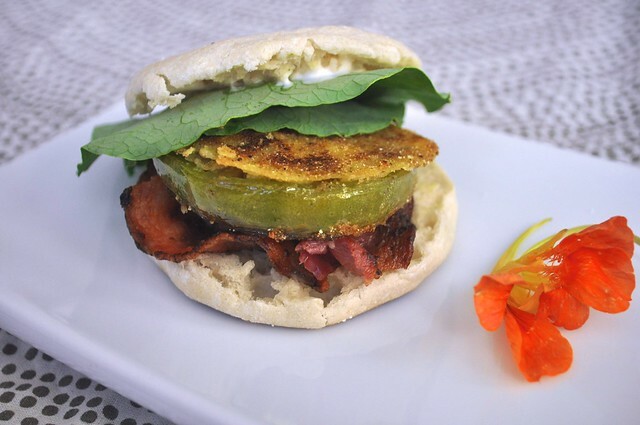 Last November I put together what I think is the perfect fried green tomato sandwich. It brings together a melee of flavors and textures that bring out the best of this unappreciated treat. Green tomatoes are a rarity here in Puerto Rico. You won’t find them at the supermarket. Only the brave ones who go to the farmers markets, grow them at home, or know someone who does (and is generous with their tomatoes) will take them in their hands and laugh maniacally smile. The perfect fried green tomato sandwich starts, obviously, with a fried green tomato. Slice the tomato in thick rounds. Season with salt and pepper. Dredge in flour. Cover the tomato slices in an egg wash, and then coat them with fine cornmeal laced with Cajun seasoning. Let them rest for a bit so the coating sticks. Grab a skillet and cook a few slices of bacon until crisp over medium high heat. Crisp it enough that you’ll want to dig into a piece or two before putting together the sandwich. But please do restrain yourself. Drain all but a tablespoon of the delicious drippings. Fry the tomato slices for a few minutes per side, until golden brown. Sometimes the coating will separate, and sit on top of the tomato like a cracker. Nothing wrong with that. Toast an English muffin. Smear with generous amounts of mayonnaise, and sprinkle some fresh ground pepper. Then, on to the secret ingredient. The elusive ingredient that makes this sandwich. We have the salt from the bacon, the tartness and crunch from the fried tomato, and a little creamy mayo. The piece the resistance: sweet, spicy greens. 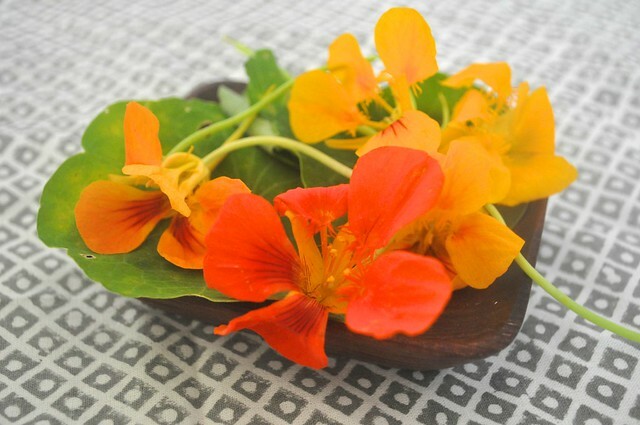 Nasturtium are cute, edible flowers. The nasturtium plants are grown as barriers for pests and other utilitarian purposes. Their leaves are tender, sweet, and spicy – the perfect offset to all the flavors of the traditional fried green tomato BLT. I’m trying to figure out what would be a good substitute. Use maple bacon and arugula? Sweeten the mayo with a little honey? For now, I’ll just waltz by the farmers market. Maybe next Sunday will be my lucky day. Now you know what my dream (breakfast) sandwich is. Do you have any of your own? Tell you story in the comments!